Ever go through phases where you can’t be bothered to actually prepare a meal? Or maybe you can manage breakfast and lunch, or breakfast and dinner, but that third meal is just asking too much? Healthy eating at every meal seven days a week is a challenge, especially in the modern world of go-go-go. I’ve found that during the week, it’s easiest for me to stay on track if I know that I only need to prepare or think about two out of three of my main meals. For me right now because I have access to a blender midday (perks of working at your own company!) the meal I don’t think about is lunch. 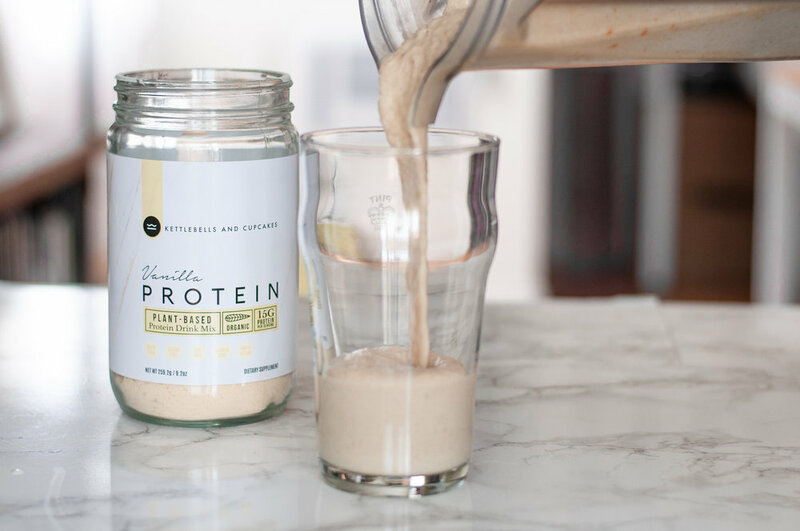 Instead I make this super easy 4-ingredient smoothie. It’s delicious, nutritious, and only takes 5 minutes to make. One could call this lazy, but what I’ve learned from observing patterns through hundreds and hundreds of coaching hours, is that predictability, consistency, and ease tend to dictate results. Also, having a pre-determined meal can save money (win, win). If you know that lunch is already planned, you’ll be less likely to opt for Shake Shack in the moment. And when you consistently eat better food, you look and feel better. And when your planned out meal is easy to access, you’re much more likely to stick with it. So really it’s more like a stay-on-track meal. Feel free to add spinach or kale if you have it on hand, but this simple combo will be a BFF for your “lazy” meal. 1 cup (about 8 cubes) of ice - ok so technically I guess there are 5 ingredients with the ice, but still. You always have ice on hand, right? 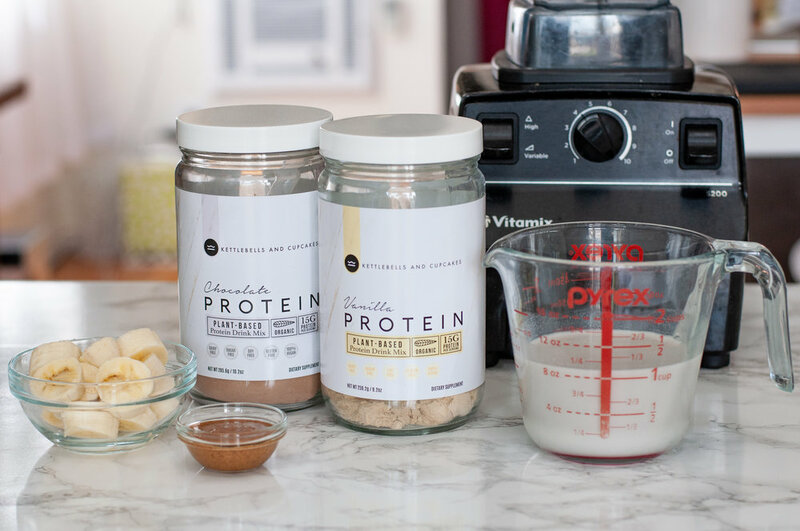 Add ice, protein powder, almond butter and almond milk to blender. Start blending, I’ve found it’s best to start the blades slow and speed them up (helps crunch up the ice better). Gradually add in banana and blend thoroughly. Pour into glass and clean blender - your life will be so much easier if you just do this right away. You may need to play around with the ice to almond milk ratio, depending on your ice machine and blender. But once you find that sweet combo, this trusty stand-by can be made on auto-pilot. Stock up on both chocolate and vanilla!